The Bee and The Bean definitely have their favorite books that they request to read again and again, but as the person who does most of the reading, I have discovered that I am just as opinionated as they are. I have found that there are certain books I enjoy reading aloud more then others. So here is a list of the books I most enjoy reading aloud and why. We first discovered this author at the story time at our local library and since then both of these books have become quick family favorites. They both tell the story of grumpy Mr. McGreely and three bunny rabbits that are always giving him a run for his money. 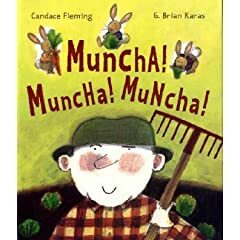 Both books use a lot of repetition and the words that are repeated are fun to say like muncha, muncha, muncha. I often find the girls saying them along with me as I read. The story of Ella Sarah who knows exactly what she wants to wear no matter what other people think of her outfit, is made even more charming by the beautiful print like illustrations. 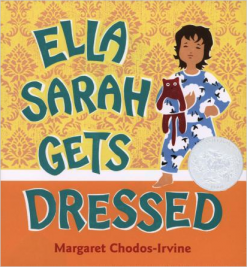 This book also has some good repetition, but one of my favorite things about this book is that each time someone tells her what to wear Ella Sarah gets madder and madder and I find that my voice does too. I think the fact that The Bee is in an "Ella Sarah" phase makes this story even more fun to read! A counting story about all the differnt insturments in an orchestra. The words are written to sound like the insturments, so you can make your voice high and fast for a violin or slow and low for an oboe. Also the whole book rhymes which makes it fun to read. 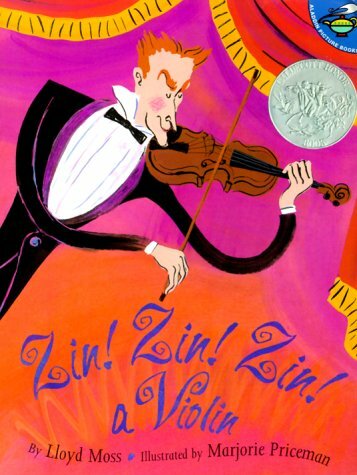 I have a fondness for this book because i remeber reading it as a kid in school but I like reading it aloud because I love yelling like the peddler selling caps in the book. It makes the girls giggle every time and we all love the monkey's! A cute story about a big brother and his little sister who are hosting their own cooking show. I love reading this book and doing the voices of the different characters. There is also a comical aspect to this book that may be missed by little ones but makes me chuckle every time. What books do you like to read aloud? Why?